I received this from the SpartanWife for Christmas. I’m thankful for it…but this isn’t a product that I picked up on my own on purpose…Why you ask? I saw this…and the Skeletor on the shelves at Wal-Mart for around $12 (I believe). If you’ve been reading the SpartanNerd blog, then you know that I have been getting a subscription to a mystery box from Funko featuring DC comics characters for a year. This box has been fantastic…and sometimes includes unexpected and quirky things. But mainly it features Funko Pop! figures. I take these figures and put them around my middle school classroom, where the children really mostly enjoy them. To me, the Kubros are trying too hard to be Funko Pop!. The figures are basic deformed…and because they are meant to be a Lego-style pop figure, the mouths on all of them look pretty wrong, and in the case of He-Man, the eyes do too. Maybe I changed my mind…Keep reading! The front of the box looks like what you see above! The sides of the box feature Filmation style He-Man pics. And the back looks like this…featuring Skeletor, Spock, Master Chief, Ezio (who? ), and Arnold Schwarzenegger. Five polybags of pieces, and an instruction book. It took me about 30 minutes to build this figure. A couple of notable things…the eyes are not stickers…they are pieced together. I dropped the eyelid…there really is no replacing that. Luckily, I found it. The back of one foot has a hole in it, and this was mysterious to me until the very end. It is where you place the “K” emblem which stands for Kubros. The basic assembly is three steps. First the head, which is made of layer after layer of “skinny” bricks. The legs and body are all one big step basically. And finally the weapons. The eyes gave me a hard time, but I think it was the arms and hands that had me scratching my head. One of the shoulder pieces was hiding under something until the build was almost completely over. I was going into “compromise mode,” when suddenly the SpartanKid found it! Slightly smaller that I expected…the box made me think he would be larger. Here is a comparison to Masters of the Universe Classics He-Man. After you build the Kubro, the only display options you have are to use weapons or not. You can move his arms at the shoulder, and his neck is also articulated as a peg-joint swivel. I am going to rate the Kubros He-Man a 2/5. Sorry guys…As a Mattel Lego…not doing it for me the same way as the recent Mega Construx Heroes. This design doesn’t work as well as a POP! figure. The line of studs for teeth in the mouth…the strange looking eyes. Where is his nose? And He-Man doesn’t have THAT SEVERE of eyebrows. They got the “fish head” haircut shape OK. But where is the cross or 200x symbol on his chest? To be fair, it doesn’t seem that Skeletor or Spock have proper symbols either from the images provided. This figure is going in my classroom, or maybe my office…Adding to my collection of pop style figures. It is OK…I think the Kubros brand is just TRYING TOO HARD to establish something in a market that is already flooded with successful products like Funko POP! Kubros isn’t adding anything to any of these brands, other than throwing out more plastic to completist collectors. So the SpartanNerd rates the Kubros He-Man at 2/5. Do you agree or disagree? Let me know in the comments! Multi-Bot. A Two-For-One! SpartanNerd is a CHEAPSKATE. Mattycollector is going out of business…Black Friday/Cyber Monday liquidation sale…40% off..FREE SHIPPING. Super-7 is letting you pre-order Ram-Man for $35 (plus shipping). Have you seen the Ultimate Edition figures? I just said a ton of things…all related to the insane buying spree I had during the week from November 23-November 29 in 2016. Truth is, Mattel doesn’t have that much left that I really want. Not even badly enough even to buy at 40% off. I sorted it out to what I emotionally wanted the most. Wind Raider and Talon Fighter sold out too fast, as did the Hover Robots. I grabbed Multi-Bot right away. Before it was all over, I also had Tongue Lasher (my favorite Snake Man), Squeeeze-a figure I always wanted, and Extendar, who I always enjoyed as a child. First, you might check out my review of Modulok, a figure in the same vein as Multi-Bot. Multi-Bot came in a brown mailer, along with the other figures I ordered in my haul. Opening Multi-Bot’s mailer reveals this classic style box. I DO remember getting these figures in these boxes as a kid. This makes Modulok and Multi-Bot the only figures you can’t actually see MIB. You get lots of suggestions for building the Evil Robot of 1,001 Bodies. Also, you can see other figures from the MOTUC line, and a bio. I usually throw the packages away, but I made exception with Modulok, and will wil Mult-Bot as well. The box is good storage for pieces you aren’t using, and look nice on display. Opening the box, you can see everything included with this figure these figures. Like I said. Two-for-one! The figure on the left is my favorite, with the motorcycle helmet look, and the clawed arms. The figure on the left has a more alien look, with more human like arms and hands. All of the legs have amazing sculpted details, and the figure features all of the articulation of the other figures. (The legs are just rockers, rather than the “Vikor style” ankles. But they serve the purpose well for this figure. Multi-Bot also features WACKY colors. As crazy as green, blue, and purple legs with orange and tan arms with a green and orange head sounds, it still works just like it did when I was a kid. I have heard some criticism of this figure, that it needs more pain details on the legs and the mechanical bits. I disagree. As it is, it looks exactly like the vintage toy. The parts snap off and on exactly like Modulok’s did, more or less, but this time the waist piece detaches from the torso, (Like Modulok’s should have done.) You can basically make anything you want. Below is the pose from the front of the box. It took me, maybe, three minutes to analyze and get it together. But that’s boring. Let’s do some crazy stuff! Two torsos tall. Six legs. Two headed monster. What more could you ask for? I worked awhile on this one. My idea was to place two torsos on one pair of legs. With what we are given, you really just can’t. I figured out who to combine two waist pieces, and then in order to accommodate the standing, it needed an extra set of legs. Multi-Bot and Modulok can mix and match parts, creating the rarely considered MEGABEAST. Here is an amalgamation to strike fear into the enemies! If you could get 1,000 bodies with Modulok, and 1,001 with Multi-Bot, you should be able to get…(wait for it.)…. I played with these toys for about two hours before doing the review. After awhile, my pre-arthritic hands started to hurt from connecting and disconnecting parts. The pieces are a little bit more rubbery than your regular figure. I can’t bring myself to take off a point for that, though. It may be more my problem than the product. What could I wish for with this figure…We got plenty of connectors, some of which I haven’t even used yet! BUT…the black piece seen above, with the two Multi-Bot heads on it…we have multiple of those. They have a male bottom piece, and two female top pieces. If Mattel had given us a few pieces that were reversed from that, we could get even more combinations. I believe this to be a design flaw…the original figure came with exactly what I’m asking for as the main way of connecting the pieces. Still, that is a pretty hard thing to look for and criticize. This is a fantastic figure, and it has a future of fun ahead. SPARTANNERD RATES MULTI-BOT A 5/5. It is technically an improvement over Modulok, who was excellent! I thought I would re-visit and comment on the three origins books. First, the Origin of He-Man. Adam “tricked” Skeletor into thinking the sword on the wall was the power sword. He swung it at the villain, who caught it in his bare hand, and crushed it. See the picture above. Doesn’t it look like the sword was crushed? Skeletor knocks a wall over on Adam, crushing him, and then we see him grab the power sword…What? How did it get there beside him? Was the sword Skeletor crushed the power sword? Did it heal itself? The moment Adam grabs it, Skeletor is looking at the tapestry that details King Grayskull defeating Hordak. Skeletor seems to think the tapestry hides the sword at that moment, and we clearly see its outline on the tapestry. So in short. This is a confusing story. It could have been told in a clearer way. If you’ll recall, the early run on the DC MOTU comics was panned by almost everyone. This book wasn’t helping. This is the first comic book I ever ordered online. The reason? I apparently missed it at the Tangled Web. Either they got only one or two copies, that were snatched up before I got there, or they didn’t get it at all. I purchased the digital copy. But only this summer, when I discovered MYCOMICSHOP.COM, did I actually come to own a physical copy. This book starts off with Keldor, who has a face full of acid. The Mike Young productions cartoon had Keldor wounded in battle…with Randor’s shield splashing his acid back into his own face. They elaborated later that Skeletor was healed by summoning Hordak. This origin story takes that same vibe, but removes the combat accident. Instead, Hordak himself caused the burn using the communication link set up by Keldor between the two worlds. As Keldor melts away on his journey to find Randor, he reminisces about his first encounter with the Horde, how he saved Randor from the invading trooper, and then his accomplishment was quashed by their father, Miro, on account of Keldor being a blue gar. Keldor eventually finds Randor, and stabs him, needing his blood to complete the transport to Etheria and be changed into Skeletor. I like this book, but the art is a little jarring. It is similar to the origin of He-Man. The flashbacks have a different look about them than the main part of the story. Now for my favorite. The ORIGIN OF HORDAK! Why is this my favorite? So many reasons. The art is classic. And looks like the rest of the series. Hordak becomes a god…he engineered an entire war between the Cosmic Enforcers and his Evil Horde, and then killed everyone on both sides. The Cosmic Enforcers seem to be “green lanterns”… In the end, only he and Zodac are left. And this is because Zodac is his brother. He wanted to relish in his death specifically. Hordak is a cosmic vampire…he needed the millions of souls on both sides of the war to fuel his godhood. The book ends with him pronouncing “Let there be light!” Dang. A blasphemy fitting of such an evil character. (In the DC continuity, what actually happened was he began the “Age of Horokoth.” The bat symbol represents Horokoth, Serpos and Zoar being the other two cosmic totems.) This story sets the stage for the tremendous power that the Masters of the Universe are up against. King Grayskull was able to defeat THAT. And his heir, Skeletor would also kill him eventually. There is one more very notable origin story. It is one of the digital only books. THE ORIGIN OF DESPARA. Despara is the DC Comics version of Adora, the Horde Force Captain. DC made her a refined killing machine. In her origin story, she is having flashback memories of when she was kidnapped. Shadow Weaver keeps her mind wiped. It is cool that what we see is actually a female version of Hordak. She became his “Darth Vader,” as he is a disembodied spirit trapped inside some kind of life support machine. Eventually, she would find herself, as the good mother that Shadow Weaver apparently is allowed her to play in Eternia’s gardens with Teela. But this story, the last of the digital ones, raised the hair on the backs of peoples necks the same way “Vikor” the figure did. We never knew we wanted a really evil She-Ra working for Hordak until this story made that happen! When you read this, and then you go back and watch the Filmation “The Secret of the Sword,” you realize how silly Adora really was as force captain for Hordak. These posts will be brief summary thoughts concerning my feelings about various “nerdtainment” items. This is becoming a necessity, as I am getting more content than I have time for a formal review. HE-MAN AND THE MASTERS OF THE UNIVERSE: “THE THREE TERRORS” (Short Animation)…This is now available on iTunes, and I watched it today. It is ten minutes of an attempt by Super7 to revive the Filmation style of animation. This little cartoon hit it at about 80%. Alan Oppenheimer still voices Skeletor, but he just doesn’t have the high pitches that he carried in his younger days. SPEAKING OF SUPER7…I was shocked to hear of their takeover of MASTERS OF THE UNIVERSE CLASSICS. I think their small figure line is cute and interesting, maybe even worth the $5 a figure. But I don’t own any…I am in the camp with many other fans that jittery times are ahead. Why would Mattel pass that property? I am glad Digital River is done. Maybe shipping will be cheaper. METALLICA: “HARDWIRED FOR DESTRUCTION”…This is the only track and also is the title track) released so far, for an album slated to release on November 18. It’s about time! The few reviews on iTunes so far compare the song to stuff on “Justice for All.” I think the singing might be a little smoother than what was on “Death Magnetic,” but the band’s all around sound is about the same. Robert Trujillo is KILLING that bass! YOUNG JUSTICE…I began watching this again…I watched it last year. What a great cartoon! I wish more would happen. DC COMICS: REBIRTH..I have been reading Batman as well as Robin, Son of Batman, and also I picked up All Star Batman. So far, the most powerful story is the Batman book that came out this week. Batman #5 dropped a couple of bombs, that they are going to kill Batman ONCE AGAIN. And that Duke Thomas is going to marry Gotham Girl. MAGIC THE GATHERING: CONSPIRACY-TAKE THE CROWN…The spoilers released so far have fans scratching their heads. This set looks to bring more power and almost better reprints than Eternal Masters and Modern Masters 2015. Very odd! First Ever Micro-Reviews! Let me know what you think in the comments! Thanks for all the views in my absence! The SpartanNerd has been really busy with his real job. But now, back to blogging. Masters of the Universe “mini comics” were truly my introduction to comic books. I had no Spider-man, Superman, or Batman comics as a small child. The only comics I specifically remember were those packed with Masters of the Universe figures. Me and my brothers would read these, and they would get stepped on, crumpled, left in the car. Pages torn out. Staples let loose. Crayon marks. Holes. All kinds of abuse. I cringe to think about it now, but I don’t think I would have had it any other way. As a teacher, I know that these experiences led me to a whole-language approach to reading, and it helped my brothers as well, who weren’t as good at reading as me. The story behind me getting He-Man and the Masters of the Universe Minicomic Collection is sort of a frustrating one…I actually ordered it at The Tangled Web in Spartanburg SC back in November, before it came out. This was supposed to be my anniversary present…It wasn’t a pre-order, so I didn’t pay up front. Apparently, sometime in the last month (While I have been away from the blog) the owner of The Tangled Web came across, and ordered the upcoming art-book thing that is all about the Filiation cartoon…He was telling me about it, and knew I would definitely want a copy. (I DO!) And so I asked him to look again about the mini comic collection. A quick look on his computer and he said. “We’ll have it in a week!” He was right this time. You have to love small business! Does the mini comic collection deliver up to my expectations? Keep reading! The cover makes it clear what you are getting. It is probably wrong to put She-Ra mini comics (storybooks?) in this and just call it He-man and the Masters of the Universe. But they did. I suppose by now, though most She-Ravers consign themselves to this. And the spine…showing that this is a Dark Horse product, as well as offering you a glimpse at how very thick this book is! It is in fact 1232 pages long! A little comparison for you. On the left is the Minicomic collection (now unwrapped.) And on the right is my only extant mini comic. “King of the Snake Men.” A gift from my wife…the italian version no less! But anyway. Look at the size difference! I found a page from “King of the Snake Men” in the collection, so you can further see the incredible difference “blowing this up” makes! Good thing too. The SpartanNerd’s vision fails him in his old age. As you read, you get little footnotes. See the bottom here. This information helps you see the mini comics as pieces of Masters of the Universe history. And they appear to be in chronological order, starting with the first “storybooks” given out…drawn by Alfredo Alcala. These show “miniternia.” The first story depicted in media about He-Man. And this story is vastly different from Filmation and later stories. He-Man is a barbarian hero in a post-apocalyptic situation, where technology and magic are lorded over the populace by experts such as Man-At-Arms, The Goddess (Sorceress), and Skeletor. The book takes some time to share interviews with the artists and writers. Here is a pic of the interview with one of the earliest writers, Gary Cohn. I haven’t read past “mini-eternia” yet. 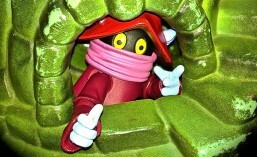 (Just got to Filmation era.) But I will go ahead and show you what else this book consists of. Here is some of the She-Ra stuff. They seem to have included it all! Here is what I considered the sad story from the first New Adventures of He-Man mini comic. Prince Adam is No More! It depicts He-Man transforming in the presence of Skeletor, knocking him down and frying his skull. (Which necessitates the “cyborg” version found throughout that particular incarnation of the story.) All of the New Adventures stories are chronicled here. And the Masters of the Universe Classics mini comics are here. I haven’t been fortunate enough to own or read any of these. I was very happy to get to see the maps in the Masters of the Universe Art Book. And since I am reading straight through, I am avoiding the temptation to go ahead and read these. (My readers should know…I am also re-reading the recent DC comics again.) I don’t want too much fantasy bouncing around in my head! And here is what is on the last pages of the book. Not sure what this is about. A book that didn’t make it to print? Reading what I have read so far has been extremely satisfying. The larger pages lets me have a deeper appreciation for the art. I have no trouble reading the script, either. The colors seem to be “restored.” I love the chronological nature of the collection as well, unfolding a history of the brand. What a great way to pay homage to something so fundamental to He-Man and the Masters of the Universe. I have read some of the mini comics online over the years. (Is that piracy?) I don’t buy many digital comics…I do use ComiXology and its associated apps, but what I read on that is usually Spawn or Conan the Barbarian books…things I don’t want laying around for my children to read. But there is nothing like having the physical book in your hand. If I had a choice, own a copy of every single mini comic, OR own this collected edition. I would go for the collection. Simply because of the large size. And they are all collected in one volume, so that is convenient! If I could rate anything higher than 5/5, then the He-Man and the Masters of the Universe Minicomic Collection would be a 6/5. It is perfect! I love the large pages, the chronological order, the interviews…all of it is spectacular!